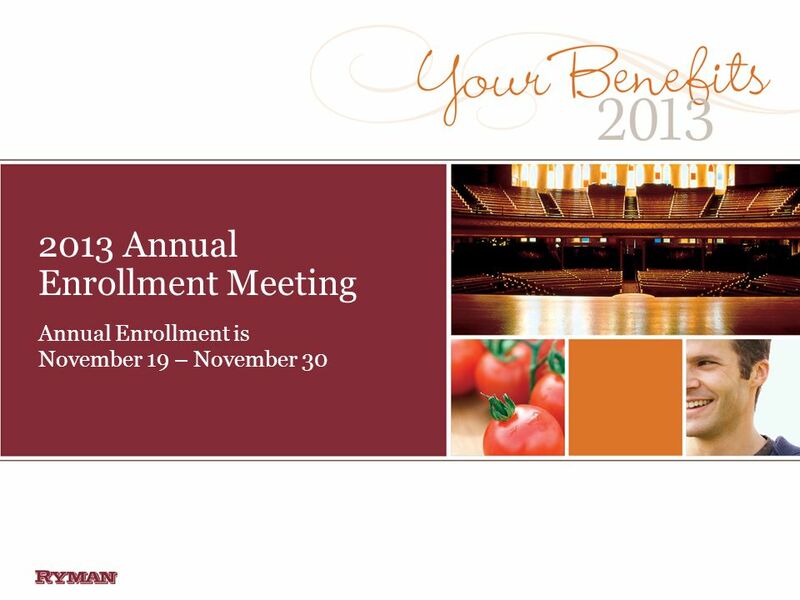 2013 Annual Enrollment Meeting Annual Enrollment is November 19 – November 30. 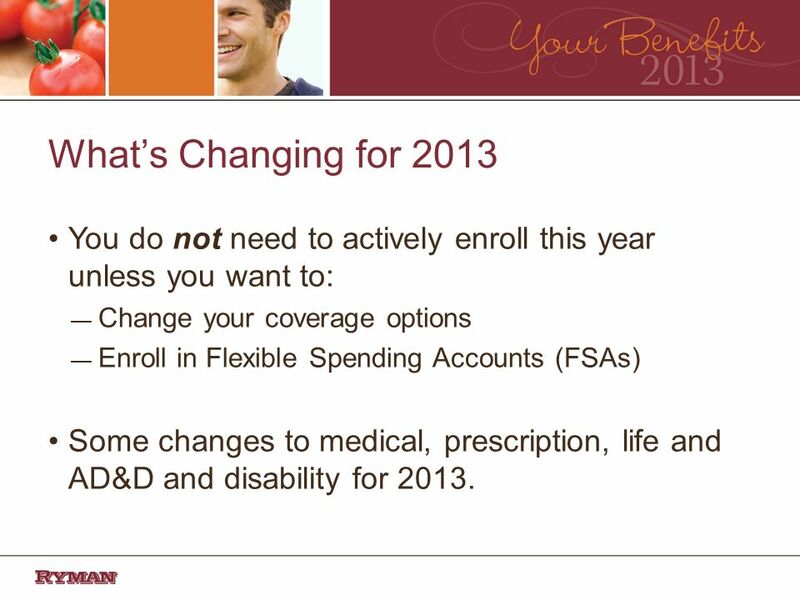 3 Whats Changing for 2013 You do not need to actively enroll this year unless you want to: Change your coverage options Enroll in Flexible Spending Accounts (FSAs) Some changes to medical, prescription, life and AD&D and disability for 2013. 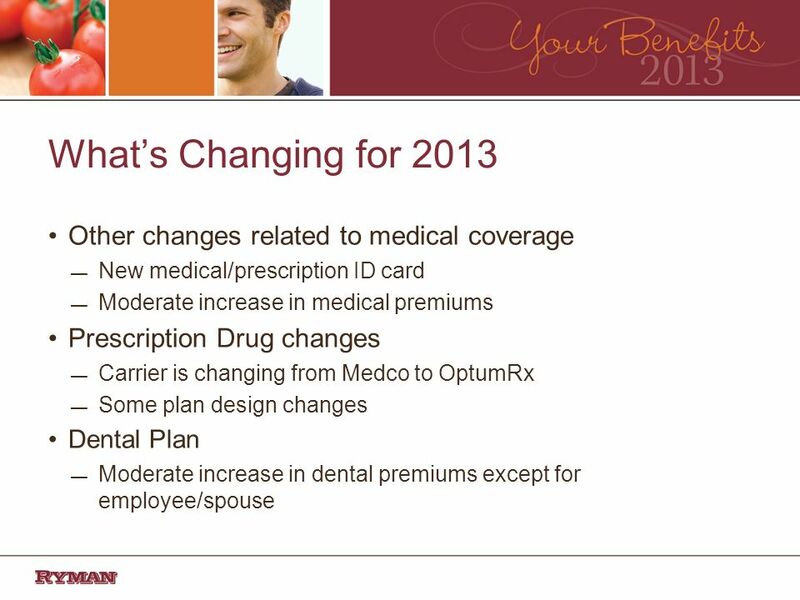 4 Whats Changing for 2013 Medical plan changes One medical plan offered. –Fully-insured, Traditional Plan with Deductible administered through UnitedHealthcare (UHC). 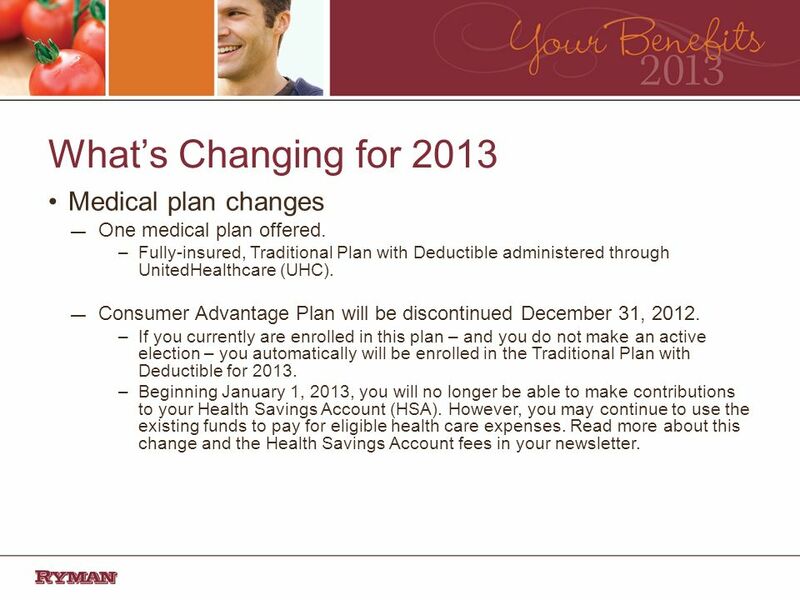 Consumer Advantage Plan will be discontinued December 31, 2012. 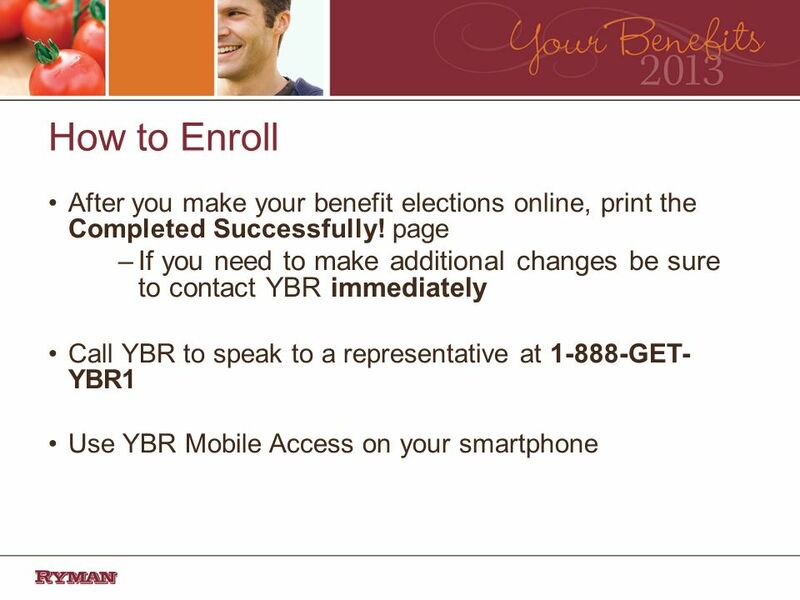 –If you currently are enrolled in this plan – and you do not make an active election – you automatically will be enrolled in the Traditional Plan with Deductible for 2013. 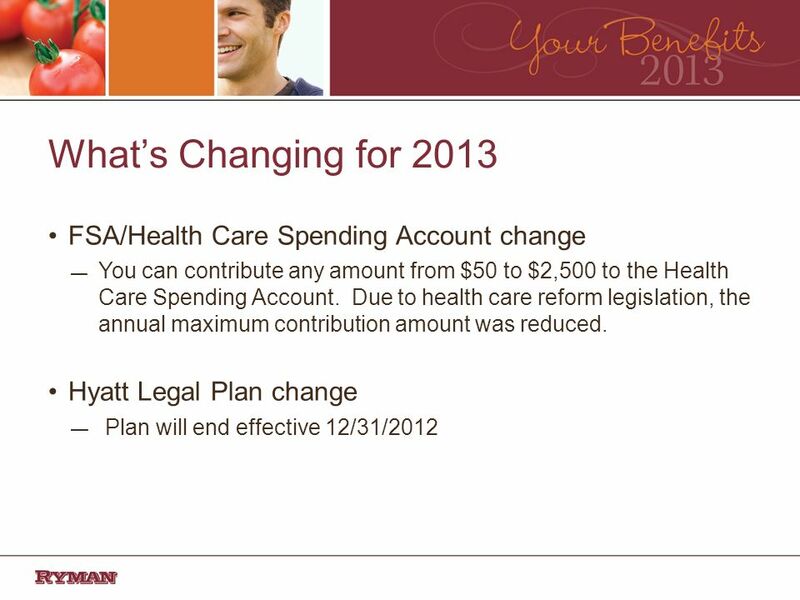 –Beginning January 1, 2013, you will no longer be able to make contributions to your Health Savings Account (HSA). However, you may continue to use the existing funds to pay for eligible health care expenses. 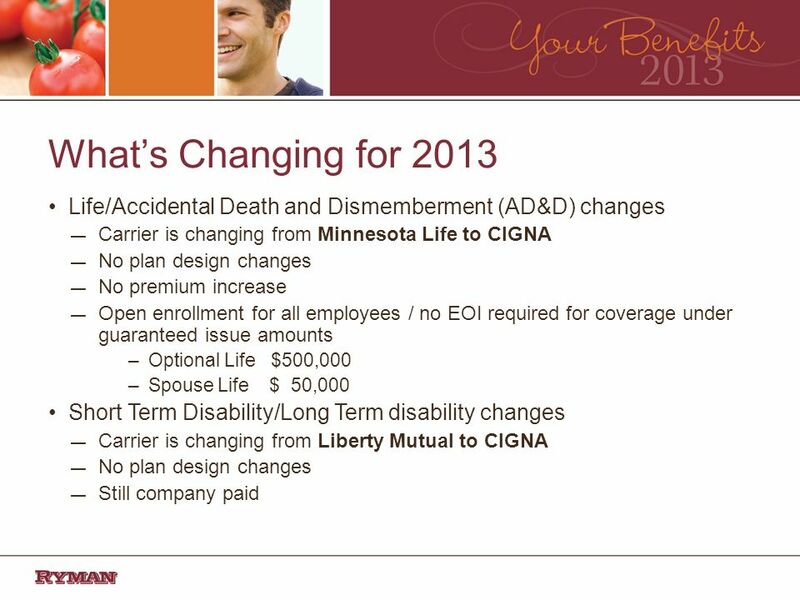 Read more about this change and the Health Savings Account fees in your newsletter. 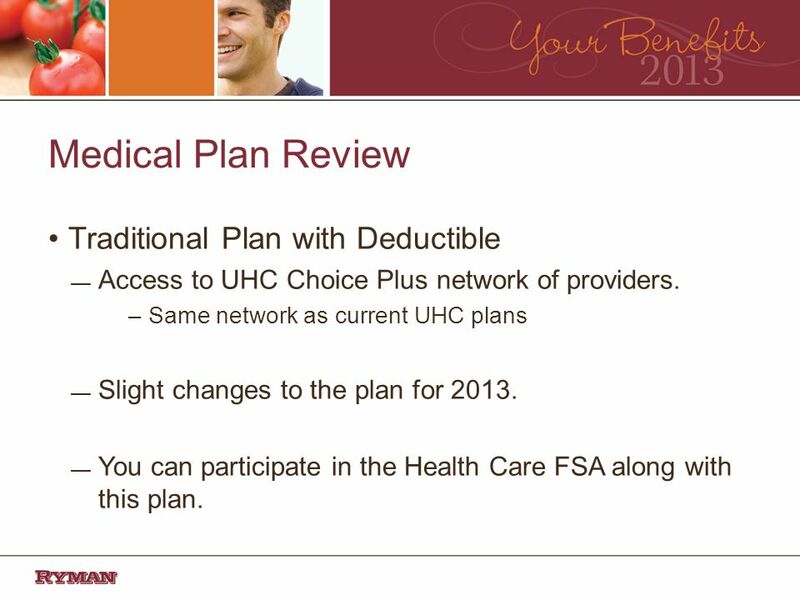 8 Medical Plan Review Traditional Plan with Deductible Access to UHC Choice Plus network of providers. –Same network as current UHC plans Slight changes to the plan for 2013. You can participate in the Health Care FSA along with this plan. 9 Medical Plan Highlights 9 Type of CoverageNetwork BenefitsNon-Network Benefits Deductible$250 individual per year $500 family per year $500 individual per year $1,000 family per year Out of Pocket*$2,250 individual per year $4,500 family per year $4,500 individual per year $9,000 family per year Coinsurance85% after deductible60% after deductible Preventative CarePlan Pays 100%Not Covered Physician Office Services$25 copay for Primary (Deductible waived) $40 copay for Specialist (Deductible waived) 60% after deductible Emergency RoomYou pay $175, waived if admitted. Ambulance (prior authorization required for non-emergency) Plan pays 85% after deductible Inpatient HospitalPlan pays 85%, after deductiblePlan pays 60%, after deductible (Prior authorization is required) Outpatient HospitalPlan pays 85%, after deductiblePlan pays 60% after deductible (Prior authorization is required) Urgent Care Center$40 copay (Deductible waived)60% after deductible *The Out-of-Pocket Maximum includes the Annual Deductible. 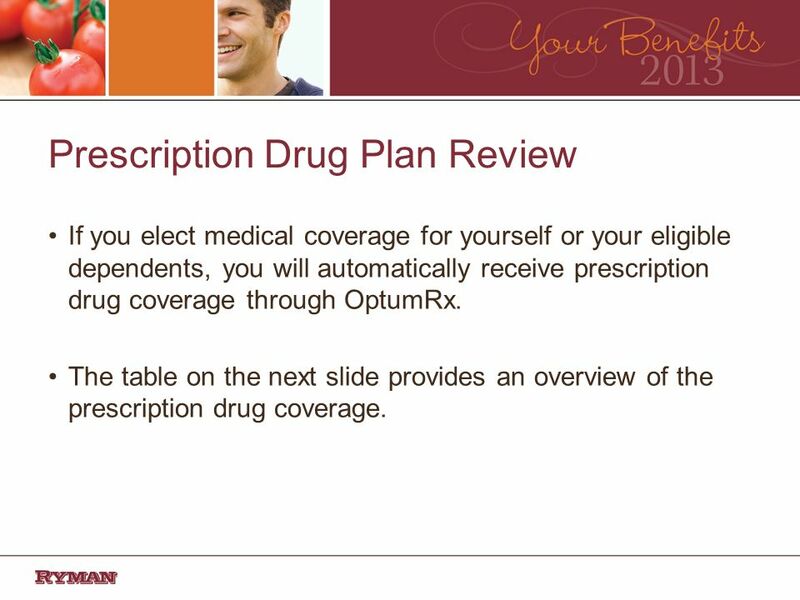 10 Prescription Drug Plan Review If you elect medical coverage for yourself or your eligible dependents, you will automatically receive prescription drug coverage through OptumRx. 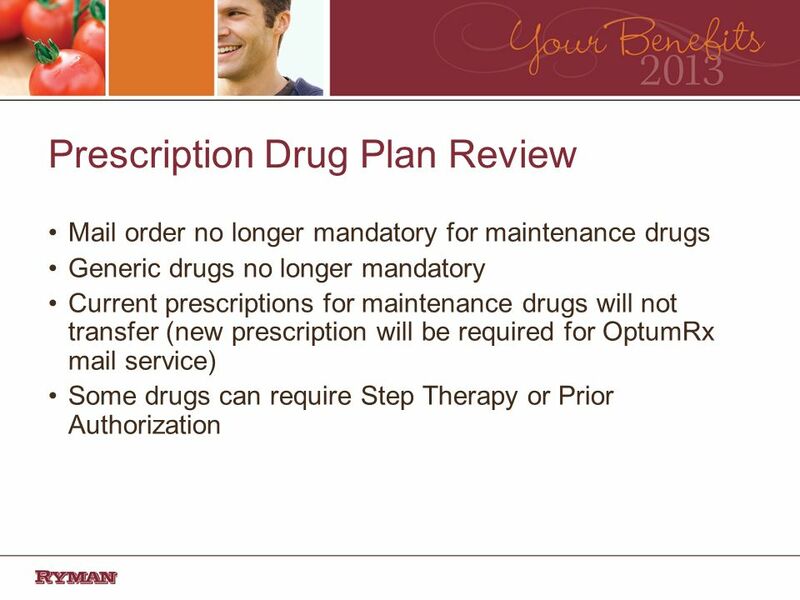 The table on the next slide provides an overview of the prescription drug coverage. 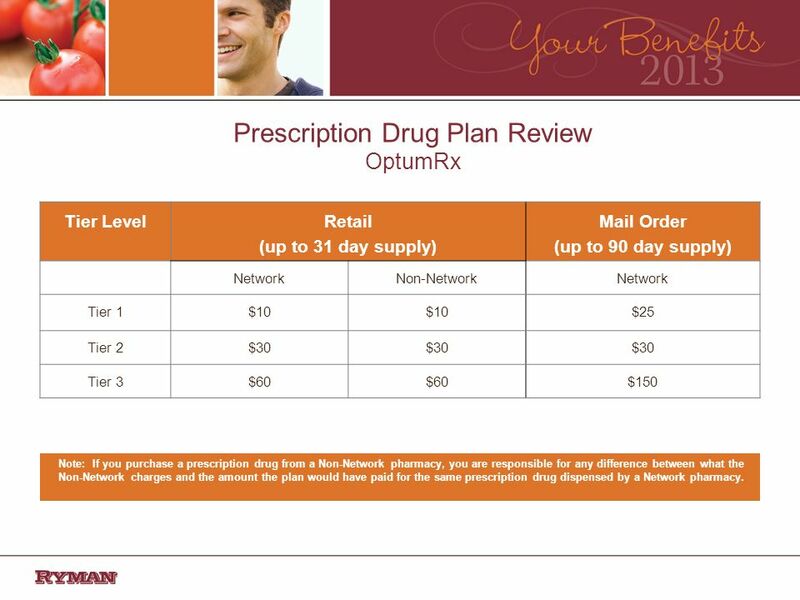 11 Prescription Drug Plan Review OptumRx Tier LevelRetail (up to 31 day supply) Mail Order (up to 90 day supply) NetworkNon-NetworkNetwork Tier 1$10 $25 Tier 2$30 Tier 3$60 $150 Note: If you purchase a prescription drug from a Non-Network pharmacy, you are responsible for any difference between what the Non-Network charges and the amount the plan would have paid for the same prescription drug dispensed by a Network pharmacy. 14 Tools and Resources Ryman Newsletter New! www.rymanbenefits.com. Find the latest benefits news, contact information for benefits providers, answers to frequently asked questions, forms and much more 24 hours a day/7 days a week from any computer with internet access. 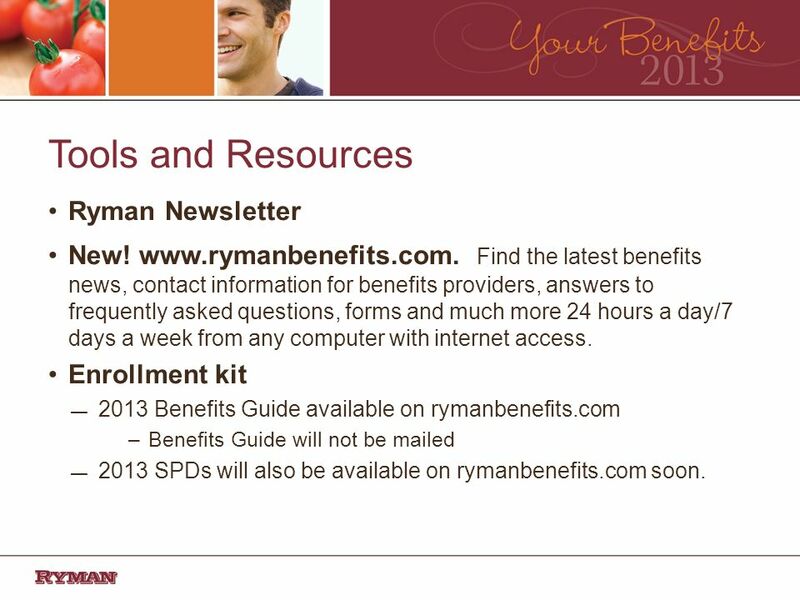 Enrollment kit 2013 Benefits Guide available on rymanbenefits.com –Benefits Guide will not be mailed 2013 SPDs will also be available on rymanbenefits.com soon. 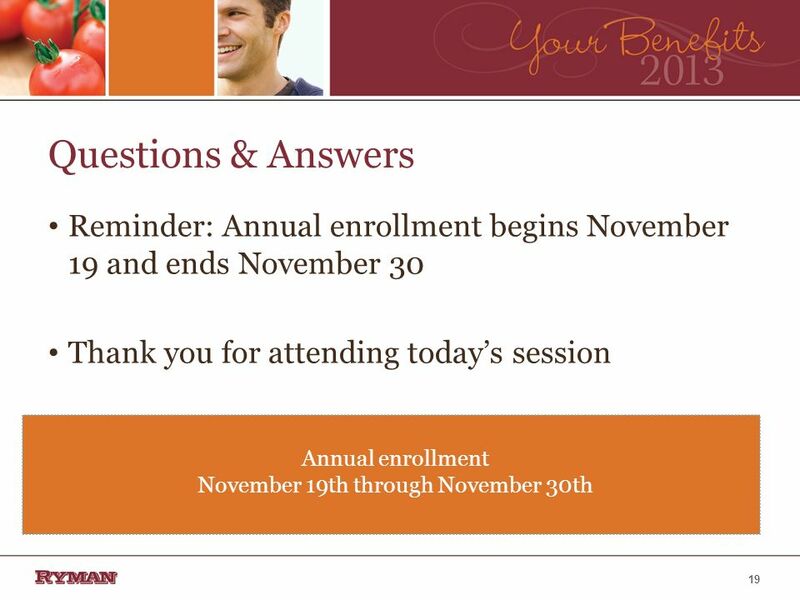 Download ppt "2013 Annual Enrollment Meeting Annual Enrollment is November 19 – November 30." 2008 Annual Enrollment Training Presentation April 2008. H.B. Fuller Company 2010 Open Enrollment: Helping you Buy Well, Use Well, Be Well October, 2009. Welcome to the State of Kansas Group Health Insurance Basics Presentation Human Resource Services Spring 2009. © 2010 Wittenberg University Springfield, Ohio New Health Care Plan For Retirees Under 65 Effective Oct. 1, 2010. 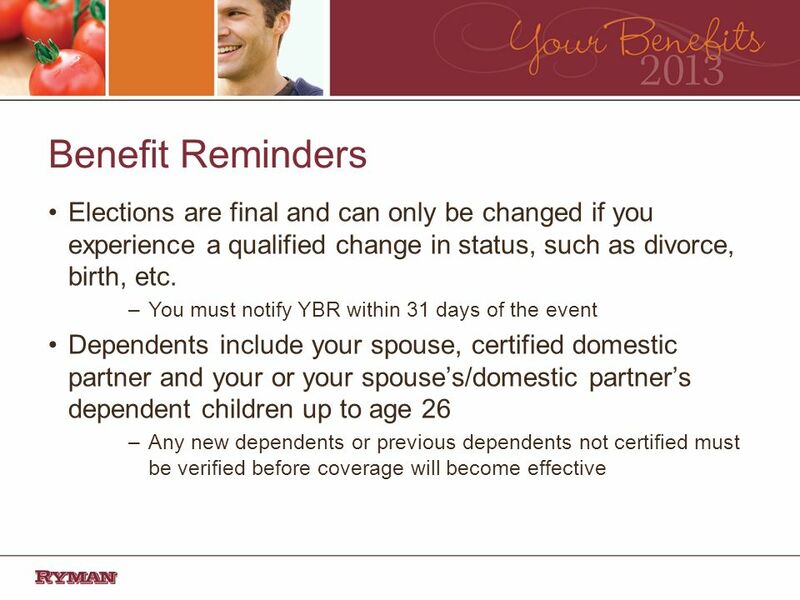 Your Flexible Benefit Program take care ® by WageWorks. 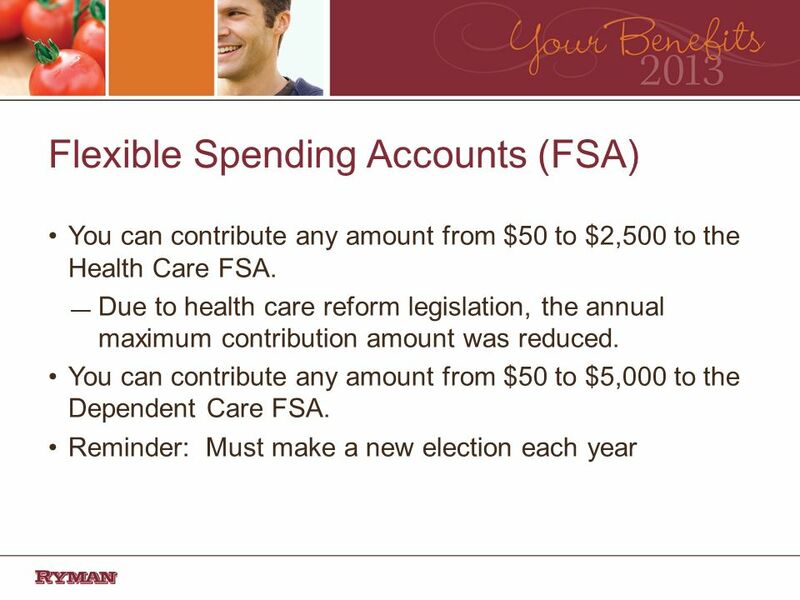 Flexible Spending Accounts Annual Enrollment Information January 1 – December 31, 2013. 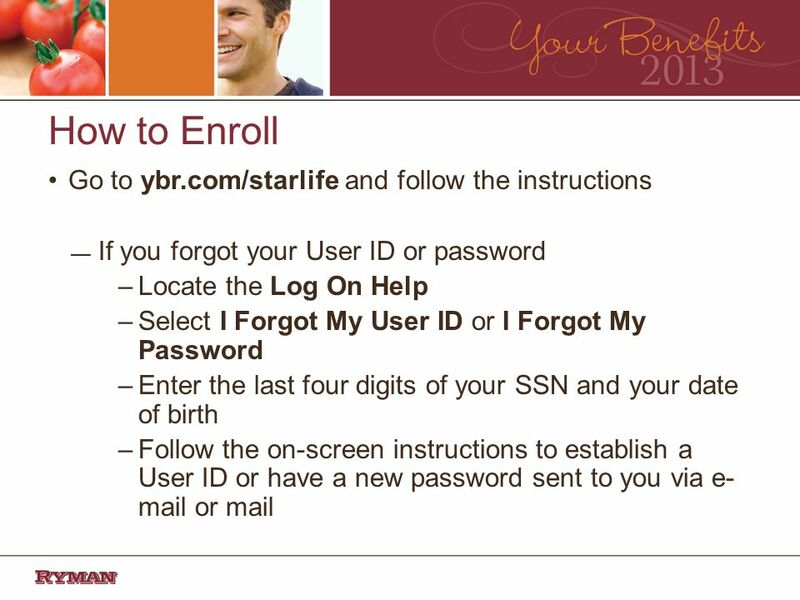 OPEN ENROLLMENT Website Open and Close Dates OPENS at 12 am, October 21, 2013 CLOSES at 5 pm November 8, 2013 Members can go online as many times as they. 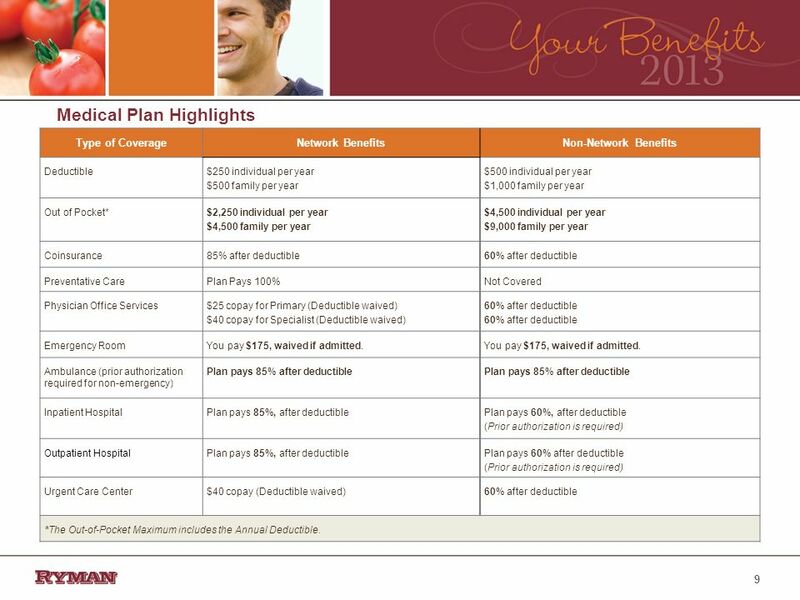 July 1, 2011 – June 30, 2012 Benefits Overview. Annual Open Enrollment  The Glendale open enrollment period for the 2011/2012 employee benefit plan year. 2011 State Health Open Enrollment Presentation. Introduction Open Enrollment dates are October 12 – November 10, 2010. 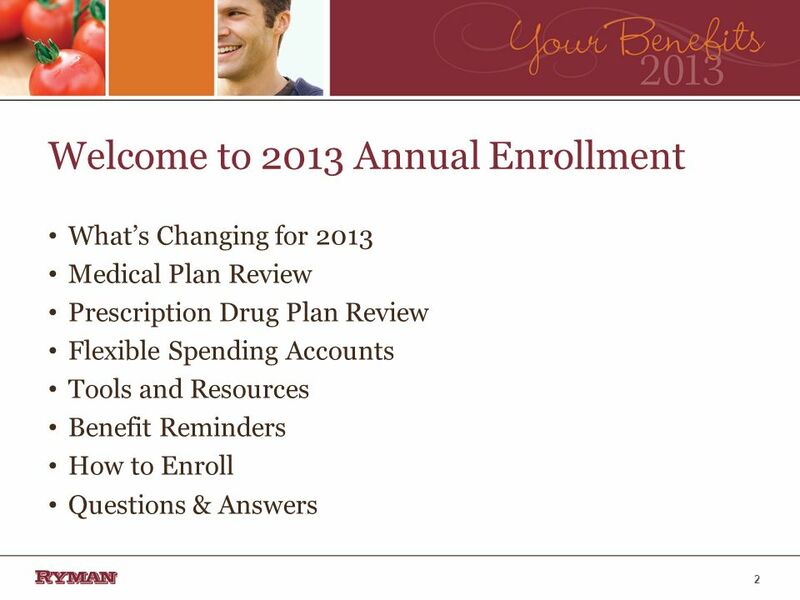 Annual Enrollment for Plan Year February APRIL 2010 Topics to Discuss What’s New for Plan Year 2011? Annual Enrollment Communications Information. ATU SPECIAL OPEN ENROLLMENT Metropolitan Council Benefits. Confidential and Proprietary Information © 2011 Express Scripts, Inc. All Rights Reserved 1 The State of New Mexico Prescription Drug Program 2013. The Texas A&M University System 1 You matter. Plan accordingly. Group Life Insurance Minnesota Life Insurance Company, a Securian Company. 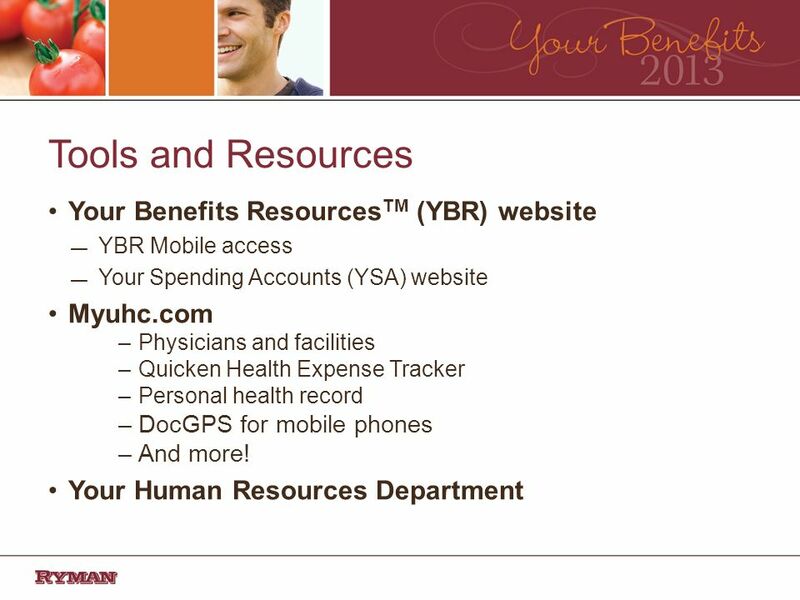 Employee Guide to Enrolling in the Health Insurance Marketplace. Center School District Qualified High Deductible Health Plan (QHDHP) with HSA New Teacher Orientation 2011. 2015 Employee Benefits November 17 & 18, Open Enrollment  Elections made during open enrollment will become effective on January 1,  East. Shelby County Government 2014 Benefits Annual Enrollment: 11/01/2013 – 11/15/2013.